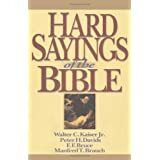 Hard Sayings of the Bible (Hard Sayings Series the Hard Sayings) ReviewI don't think there is any mystery to the fact that some biblical passages are tougher to interpret than others. This is why I so appreciate this book. In fact, I had bought the individual IVP books that were later compiled into Hard Sayings of the Bible, and I spent the money for this because it's nice having it all in one bound volume. I have used this many times to see if a particular passage is talked about, and probably half of the time it's in there. (I consider this to be a pretty high percentage.) While I may not always agree with the assessment, it is nice to get other perspectives, and more than once they have convinced me of their position on very difficult passages. Want to learn more information about Hard Sayings of the Bible (Hard Sayings Series the Hard Sayings)?